Every year, right about the time when racing enthusiasts start to mourn the offseason and resign themselves to watching ball sports, fans and racers in the know pack their bags and head to Florida for one of the biggest and best stock car events of the year: the Snowball Derby. It’s the race with a misleading name, as the only “snowball” seen throughout the weekend is the person dressed as the race mascot, or maybe a wad of ice from a beer cooler. Temperatures for the Sunday race tend to hover just under 70 degrees, and there’s not a bit of real snow in sight. While snow overtakes many of the other racetracks in the U.S., Five Flags Speedway in Pensacola, Florida tends to put forth the perfect weather for racing. The Snowball Derby is a no-points, unsanctioned Super Late Model stock car race, and when the only thing on the line is bragging rights, the competition is even stiffer than some regular-season races. The Snowball Derby began in 1968, and drivers have come from across the country to compete ever since—the prestige of the race keeps a lot of drivers coming back, even when they’ve left the Late Model ranks. Chase Elliott won this year’s 48th running in the tech shed when unofficial winner Christopher Bell had his victory stripped by virtue of a disqualification, and the successor of Jeff Gordon’s No. 24 car for the 2016 season, Elliott, hasn’t missed a Snowball Derby since 2009. But the racing results, strange name and comfortable temperatures don’t even begin to tell the story. It all starts with qualifying on Friday. That night is arguably one of the most tense event a person can spectate, let alone participate in. 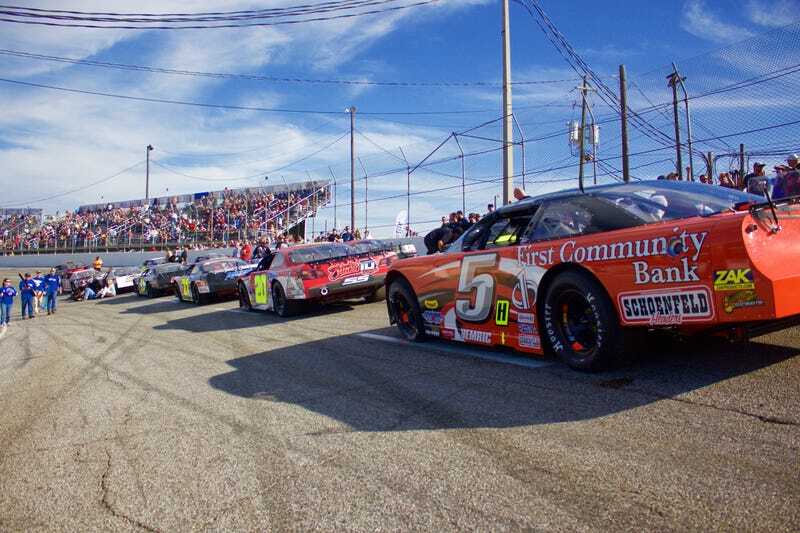 Around 70 cars enter the Snowball Derby each year, and time trials lock in a mere 30 of them. This year, just over two-tenths of a second separated the polesitter from the first driver sent to the last-chance qualifying race. That’s not uncommon for this event. Everything is just that close. Though the race hasn’t been televised for much of its existence, it’s the subject of conversation throughout the short-track and NASCAR worlds during the first week of December. Winners include the likes of Darrell Waltrip, Kyle Busch, hometown favorite Johanna Long, Donnie Allison and Chase Elliott. The race weekend coincides with the NASCAR Sprint Cup Series banquet each year, but a handful of drivers send teams out and have relatives competing in the event. Whenever Busch, the 2015 Sprint Cup Series champion, doesn’t get an invitation to the banquet, you can usually find him in the field. In fact, the Snowball Derby is where Busch found his Camping World Truck Series driver and 2015 series champion Erik Jones. When Jones defeated Busch in the 2012 edition of the event, he essentially signed himself a driver contract that later lent him a championship and an early Sprint Cup Series debut. From Late Model standout to NASCAR champion, all starting with a Snowball Derby victory. That’s just how things happen around here. Each year, I get involved by participating in a Snowball Derby “predictions post” with a couple of the fellow writers who attend the race. And each year, I stare at the entry list blankly when trying to decide which five drivers have the best chances. More drivers than I know what to do with wind up on my “top contenders” list. Picking five of them to watch? Impossible. Laughable. The field is too stacked. With last-chance qualifiers and provisional starting spots in place, a maximum of 37 cars can take the green flag each year for a 300-lap race around the half-mile asphalt oval. This year, drivers included Elliott, Bell, Daniel Hemric, John Hunter Nemechek, Corey LaJoie, NASCAR K&N Pro Series East champion William Byron and Jeff Burton’s son, Harrison Burton. Ross Kenseth, son of 2003 Sprint Cup champion Matt Kenseth, usually competes, but it didn’t work out this year. The big-time racers, short trackers and everyone else are on a fairly level playing field. One year, a guy like Elliott or Jones will win. The next, a Late Model regular such as Augie Grill will take it. And the mesh of different disciplines while everyone is battling for that win—that is a sight to see. But there’s a more interesting aspect of the competition that we saw first-hand evidence of this year—the sense of community between drivers and teams. But it’s what happened during the repairs that shows just what the Snowball Derby is about. At least five other teams—including Long, Bubba Pollard, Richie Wauters, Murray Timm and Larry Jones—offered Burton’s crew a car for the race. The elder Burton said Joe Nemechek, father of 2014 Snowball Derby winner John Hunter Nemechek, even offered technical support to the team. “The Longs did what they did,” [Jeff] Burton said. “Hell, Hunter Robbins (a rival Super driver) was working with us until one in the morning. Johanna was with us. Joe texted me and asked if he could help. It was something. Teamwork at its finest. Between people who aren’t even on the same team. Ever heard of the whole “we don’t disqualify drivers after a race, because we want fans to go home knowing who won” sentiment? Nah. Not a chance. Not at the Snowball Derby. Even if you grab the trophy, take photos with Miss Snowball Derby and celebrate your triumph in one of the biggest races of the year, head technical inspector Ricky Brooks will knock you right off of the results page and hand your trophy to the first driver who finished behind you and passed tech. The race decided off of the track occurs in Brooks’ “Room of Doom”—in other words, the tech shed. The place is so famous that there are actually T-shirts to commemorate it. We saw it happen twice this year for Bell, whose Kyle Busch Motorsports ride failed technical inspection both after qualifying on pole for the race and after winning the actual race. That’s not saying the entire rest of the weekend isn’t just as intense—after all, when the best short-track racers from across the country come together on a small circuit that’s worn and cracked as can be, the intensity never really stops. It’s a race unlike any other.